Well, Shirls did it. She created an uber gorgeous kit that sold out in just a few hours! These next two are in a ring bound album for my TMIR (Tally Month IN Review) where we document each months worth of photos. I LOVE that star embellie... can't remember who makes it right now, but it's wicked COOL. And that cream & black damask paper. yeah, it's flocked. LOVE it! 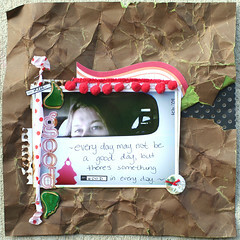 That lacy paper above is from Creative Imaginations.. LOVE it. So many wonderful elements in this kit.. I almost wish I had purchased another one before they sold out. Link me up once you get your kit so I can see your smashing work! My desk is a mess, so I'm going to clean it up and start to scrappin' again. gorgeous layouts! love your blog header too!! Leah, your layouts are just GORGEOUS!! 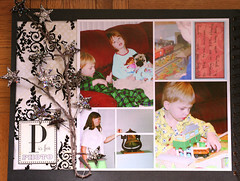 Love the TMIR one especially...you know how I love a layout with tons of pics! That pic of the little yellow flower and the pics of the kids on the trampoline in your previous post just make me happy! I'm SO excited that Spring is almost HERE!! did you finish cleaning your desk off?oh and I tried calling you yesterday did you get my mesage? i miss you and am thinking of you!! 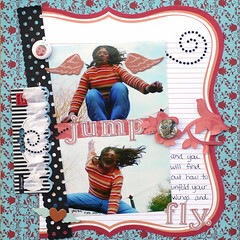 love what you did with Shirley's kit freaking ROCK'D it girl! !you ROCK!Love ya hugs! 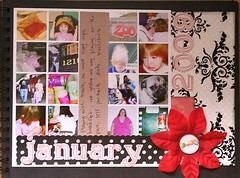 Beautiful pages girlie! 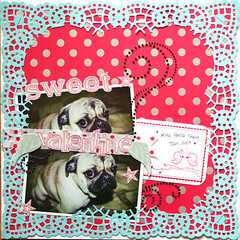 Love the one with the lace paper! Awesome, awesome stuff!